I’ve been arguing with an Exchange 2016 server lately, due to what I suspect is a dodgy IBM-badged MR10i RAID controller in a x3650 M3. It has been kicking disks that seem entirely fine out of RAID1 volumes, which effectively has the same side effect as losing a disk. I intend to publish a few posts with some of the links and practices I’ve used lately. The original, excellent instructions from Mike Smith at Serenity-Networks, despite being for ESXi 5.5, seemed to work with some minor adaptations for ESXi 6.5.0 Update 1 (Build 5969303), with the latest versions of software from Avago (Broadcom). 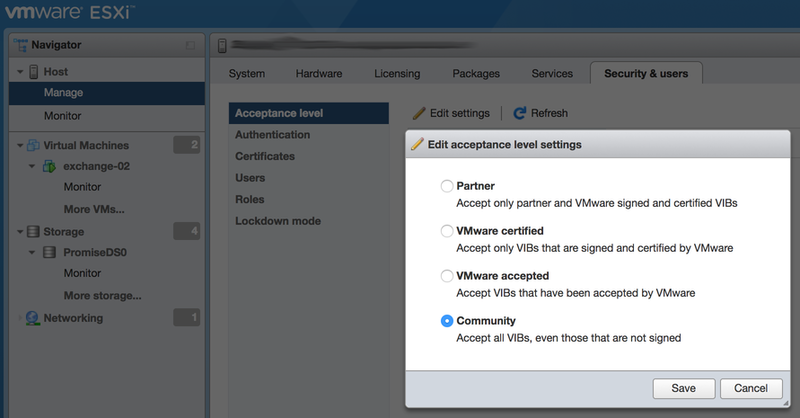 Adjust the “acceptance level” to allow installation of unsigned VIB files: In the Navigator column, select Manage, then select the Security & users tab. Then, click the Edit settings button and choose Community. Copy the LSI SMIS provider (the file with .vib extension) to the /tmp directory on ESXi host (scp/WinSCP/your client of choice). I found that my sneaky attempt at copying it to a shared volume at /vmfs/volumes/… was hit and miss; when it was a fibre channel mount, the install worked properly, but if the datastore was on a local disk, it died with an error message. I also had to disable the firewall on the ESXi host. Bad practice, but I don’t have a list of the specific ports to open at present. 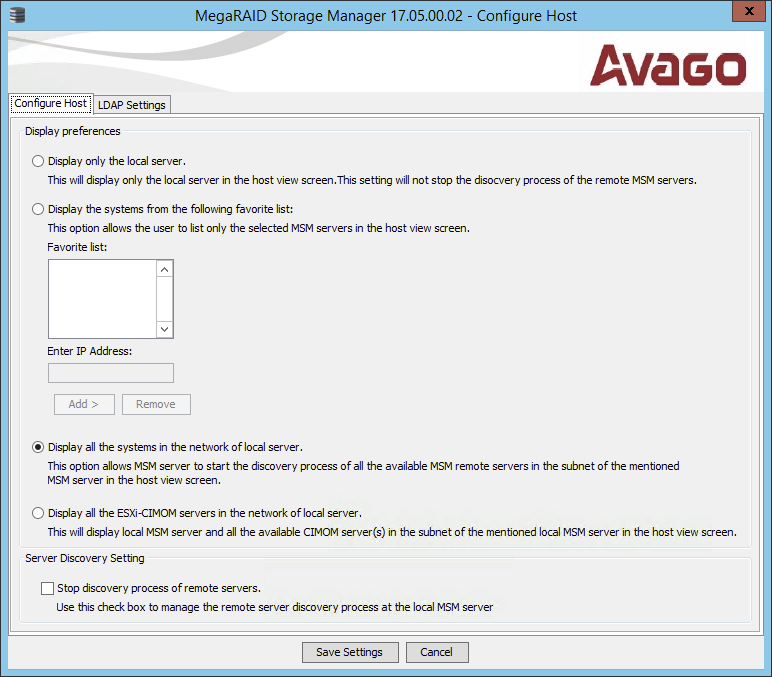 Reboot the ESXi host when complete. You can and probably should do the usual behaviour of taking it into maintenance mode, but in my case everything shut down and came up cleanly as VMWare Tools was installed on each guest. It was hit and miss as to whether I had to add the line from /etc/hosts on the ESXi server with the hostname to my Windows box. I found that eventually creating both A and PTR records in Active Directory DNS, combined with turning off the ESXi firewall, were sufficient to get the MSM client on a domain-joined Windows server to connect – not even necessarily a guest VM on the same hypervisor.